I've been working on this dog jacket for my GF's dog, Buddy. I told her about it last week and she was dying with enthusiasm and wonderment of what it could possibly be. 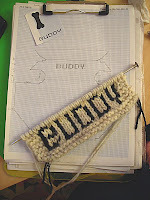 As you can see I've been hard at work just planning this thing out and think the word "Buddy" will do as you see in the sample I knitted although I did mess up the "b" a little bit. I don't think it's possible to knit words in garter stitch though, but I'm still working on. Man, I hope it fits!